What’s the most popular pie in America? It just depends on whose survey you’re viewing and where it’s being conducted. But in the majority of surveys, apple pie rules. The folks at NPR in 2012 named apple pie as the favorite of those they surveyed. And in a 2008 survey by Crisco and the American Pie Council, nearly one out of five (19 percent) of Americans preferred apple pie. However, Therese’s apple pie now has some competition. Her fresh strawberry pie is slowly becoming my favorite. Made with fresh fruit from our garden, the strawberry pie also features her homemade crust (recipe follows). Therese already has made one strawberry pie with this season’s bounty, and another is on the way. If survey respondents whose preference is apple pie would sample this scrumptious dessert, I’d bet more than a few minds would be changed. Sift flour and salt together; cut in shortening with pasty blender until pieces are the size of small peas. Sprinkle 1 tablespoon water over part of mixture. Gently toss with fork; push to side of bowl. Repeat until all is moistened. From into ball. Flatten on lightly floured surface by pressing with edge of band three times across in both direction. Roll from center to edge until 1/8-inch thick. Heat oven to 450 degrees. Place dough in pie pan. Bake pie crust, about 15 minutes. Meanwhile, in a small bowl, crush enough strawberries to make 1 cup. 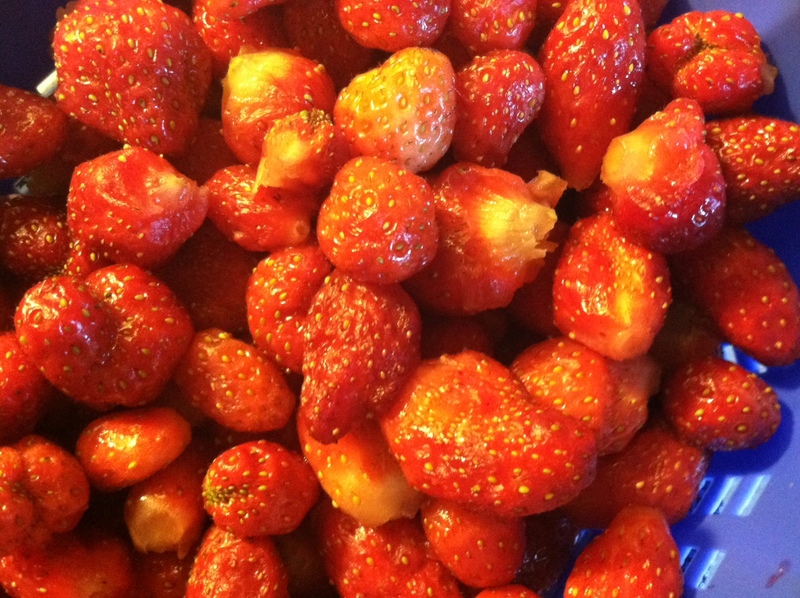 In 2-quart saucepan, mix sugar and cornstarch; stir in crush strawberries and water. Cook, stirring constantly, until mixture boils and thickens. If desired, stir in food color. Cool completely, about 30 minutes. Place remaining strawberries, whole or sliced, in cooled baked shell. Pour cooked strawberry mixture evenly over berries. Refrigerate until set, about 3 hours, before serving with dollop of whipped cream. Yum! You are one lucky man. Strawberry is my son Matt’s favorite dessert of any kind. He grew up with a strawberry patch and home grown berries make a difference. My favorite pie is rhubarb but throw in some strawberries too and you need less sugar. Homemade crust takes practice but a good one makes it special. My husband, Jack, has been wanting to make a strawberry pie so I’ve printed this recipe and will let you know………he is a connoisseur.